Students from Our Lady of Perpetual Help were offloaded yesterday from a chartered city bus after being taken to St. Francis West from the Ewa Beach school. Smoke from a burning van sent 22 students and three staff members of Our Lady of Perpetual Help School in Ewa Beach to the hospital yesterday as the school day ended. The city Department of Emergency Medical Services used a city bus to transport 22 students and three staff members to St. Francis Medical Center West from the school shortly after 1 p.m. 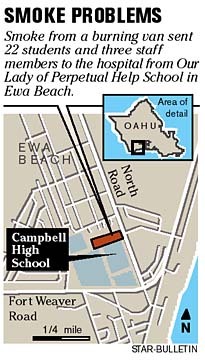 The school day was to end at 1:30 p.m.
"Thank God everybody is fine," said Sister Davilyn Ah Chick, school principal. About 220 students, from kindergarten to eighth-graders, attend the school. The students and staff transported to the hospital had symptoms of nausea, stomachaches, watery eyes and itchy throats, said Bryan Cheplic, Honolulu Emergency Services spokesman. St. Francis West spokeswoman Cheryl Tamura said the victims arrived at the hospital "alert and ambulatory" and with some suffering from smoke inhalation. Some were given gastric medication for nausea, but others needed only juice and cookies, she added. All were treated and released yesterday with no serious injuries. The fire started after 12:30 p.m. in the school parking lot after a parent, picking up her son, left her Dodge Caravan running in the lot. "Me and my class started to smell gas," said fourth-grader Ezrah Carvalho, who was heading out for a physical education class at the time. His class went to the parking lot and saw the bottom of the van in flames. "It never exploded, it just lit up," he said. "It smelled like burnt charcoal. Everything was all foggy." Smoke from the fire traveled across the school grounds and into the classrooms. "Our faculty staff evacuated (the school) to our church," said Ah Chick. "As soon as the Fire Department put that out, we found some of our students had symptoms." Kenison Tejada, Honolulu Fire Department spokesman, said the cause of the fire is unknown. He also added that a hazardous-materials crew investigated an earlier report of a noxious odor, similar to propane, on the school grounds. 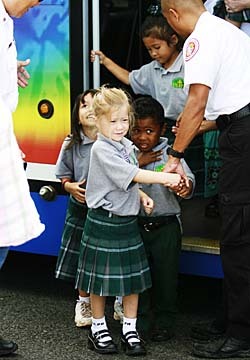 Students from Our Lady of Perpetual Help exited a chartered city bus yesterday after being taken to St. Francis Medical Center West. All were treated and released with no serious injuries. "We don't know if the auto fire caused the kids to be sick," Tejada said. Ah Chick confirmed that the smell had been reported earlier by a teacher, but the staff checked the area and was unable to find any odors. She said the "sporadic" odor might have come from a construction project behind the school, but notified the Fire Department when it came on scene. The hazmat team investigated and "did confirm that there wasn't anything in the air," she said. No one reported being sick until after the smoke spread through the school, she said. Brianna Totty, 10, a fifth-grader at the school, said that just before the auto fire, she smelled a "horrible gasoline" odor in her classroom and suffered from a sore head. "I felt like I couldn't breathe," she said, adding that the smoke from the van was gray and spreading. Brianna also said she smelled an odor earlier in the day, but it was similar to chemicals she has smelled from science class. The odors were gone after lunch and had no effect on her, she said. 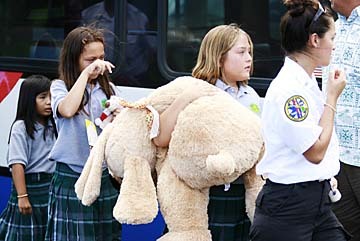 School officials notified Brianna's mother and other parents that students were transported to the hospital.